Other naysaying fans are simply hung up on how ice will be maintained in the Los Angeles climate. Sporting News writer, Sean Gentille, wrote NHL Stadium Series a Gamble on Moneymaking Power of Outdoor Games, a blog post that discusses how additional outdoor games dilute the market. The article begins, “At some point in young adulthood, you figure out that, theoretically, you could eat birthday cake at every meal. 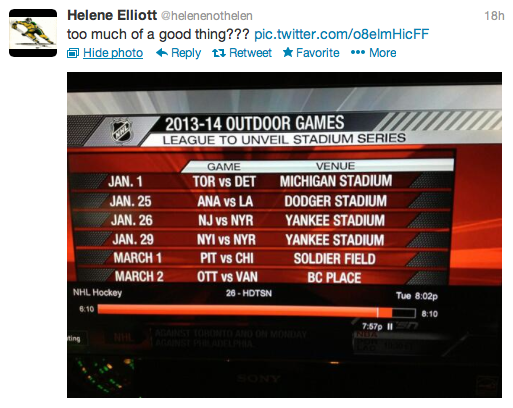 Most people don’t.” While I see what Gentille is saying, the additional outdoor games are not under the label “Winter Classic”. 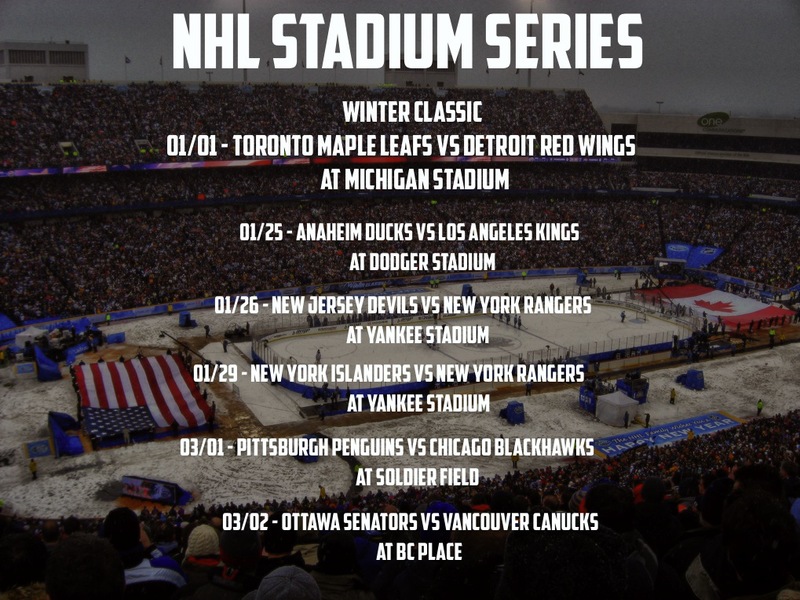 The Winter Classic is still unique with the New Year’s Date, pre-game 24/7 episodes on HBO, intrigue for casual fans, and other festivities like the alumni games. I don’t know about everyone else, but I love cake all the freaking time. Stadium Series games will be played both before and after February’s 2014 Sochi Olympics. While it is not confirmed that NHL players will be allowed to play in the Olympics, it is conceivable that these Stadium Series games provide a buffer for fans in case negotiations between the IOC, NHL, NHLPA, and IIHF head south (although I doubt that will be the case). At this point, the Stadium Series is an experiment for the league. Employees know that one outdoor game works, so now it is time to try out more. The league is a business, remember? I am sure NHL bigwigs are hoping the games will bring in more hockey fans, create increased support after the lockout, and yes, rake in additional revenue. If the league can gain fans and increase TV viewing numbers after a horribly long lockout, why wouldn’t the Stadium Series work? Sidenote: I just joined the Pens Nation team at http://www.thepensnation.com. Be sure to keep an eye out for this banner on the website to see my posts!